Norsaga: Odds and Endings looks to expand the core gameplay of the original, adding a trio of modular add-ons. While it won't be the expansion that changes your mind if the original isn't to your taste, Norsaga: Odds and Endings only deepens the core gameplay with the variety it introduces. A while back, we previewed Norsaga, which had itself a successful romp across Kickstarter and generated a very beautifully presented take-that style card game. 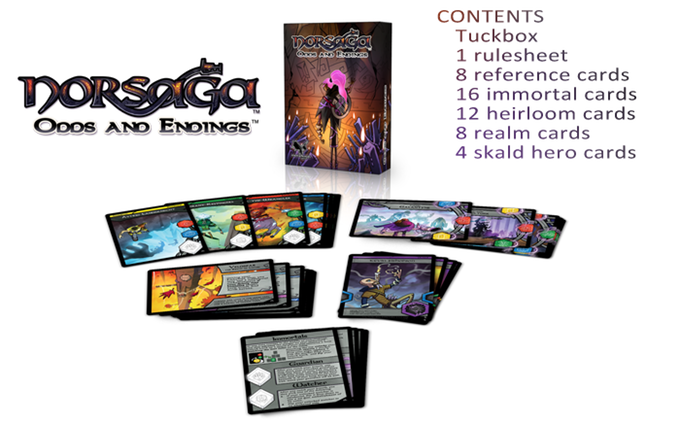 On 5/30, the folks at Meromorph Games will be heading back to the crowdsourcing well to Kickstart Norsaga: Odds and Endings, a small pack of modular expansions for this color-matching, backstabbing little game. Without rehashing our review of the original, Norsaga is a game all about telling a boastful tale of your ancestry, to prove how you are the hero of the saga of blah blah blah, look, it’s an abstract color matching game, with a big emphasis on player interaction. You will build an ever-shifting family tree of cards, racing to be the first to move all the traits you need to win into the tree before your opponents can manage to do the same. First player to move all their requisite traits into their tree wins. Fouling up this race are Embellishments, powers that you gain by having a lineage strong in one of the colored attributes. Many of these powers really let you mess with your opponents, and the effective, vindictive use of Embellishments can be the key to spring-boarding you to a sudden shock victory or wrenching success away from an opponent on the verge of winning the game. Jess: Ok, so, straight up, Norsaga isn’t my kinda game. It’s gorgeous, but without the stabby bits, it’s a pretty passive luck-based race. Andrew: Right. And with the stabby bits, it’s a mean little game, where undermining your opponents is absolutely key to stopping them from securing the relatively easy-to-achieve victory conditions. If you don’t trip up the players next to you, they’ll probably finish the race in under 10 minutes. So the big question we had about Norsaga: Odds and Endings was this: would it change the core of Norsaga’s gameplay enough to get us a little more interested? Well, let’s review each expansion bit by bit and discuss. The basic gist here is that each family has an immortal ancestor, a special character card that sits outside the hierarchy of the family tree. 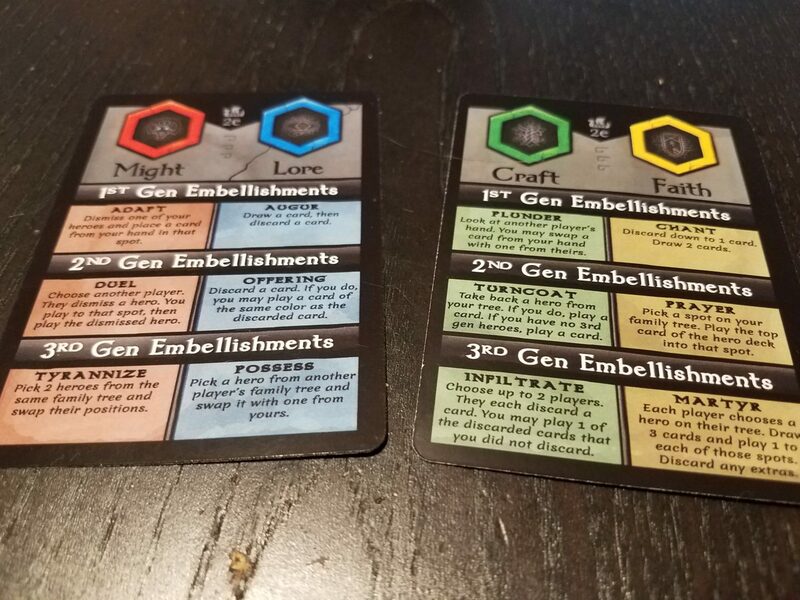 Unlocked by adding characters of the appropriate color, the Immortals are either guardians, who can sub in for other family members on the fly (and always come back if discarded), or Watchers, who give you bonus opportunities to use Embellishments. Jess: These, for me, didn’t add much. It’s nice having the insurance of a Guardian ancestor, and more opportunities to use Embellishments is useful, but ultimately I didn’t get much value from them. Andrew: I actually thought this one was neat. Since the mechanism by which Immortals get added is a natural part of gameplay, it doesn’t slow you down, and it does give you one or two more tactical choices for this otherwise pretty simple game. Each player gets a cursed heirloom at the beginning of the game. Each time a character of the appropriate color is discarded from your family tree, your heirloom will become one step less cursed. Once the last color is discarded, the heirloom’s curse is lifted and permanently adds a second color to your youngest hero, giving you access to a wider range of Embellishments to use. Andrew: I liked this one a lot. Because it capitalizes on something that is normally a wasted mechanic (tossing characters from your tree), it can feel like a little bonus. And once unlocked, I really like the flexibility that they introduce. Jess: Yeah, this one was a really neat idea. The whole ‘dual color’ hero is smart, and it means opponents never quite know what to expect from you. Fun and smart. Some Realms change things up a little. Others, much more. 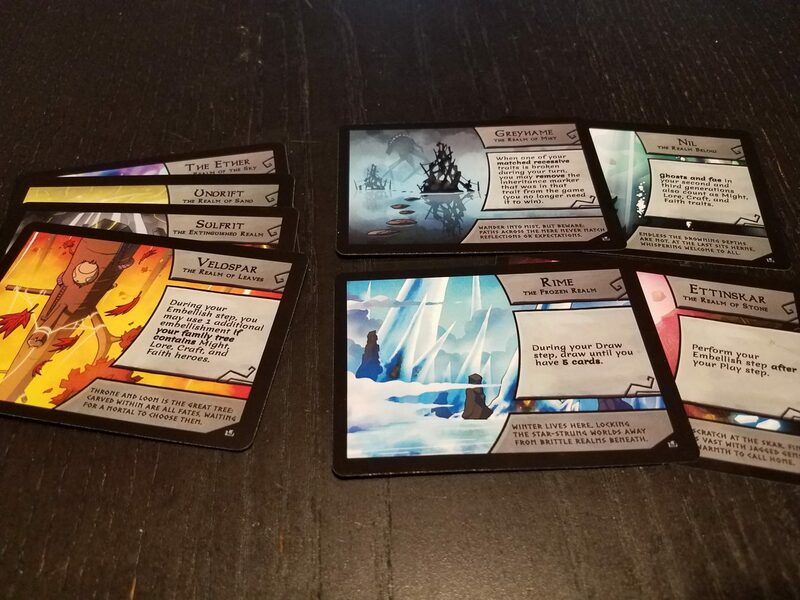 A single realm card is put into play each game. These are game-wide rules changes, adding a variety of permanent effects, such as increasing hand size, changing the order of actions, making Ghost and Fey characters count as wild heroes, and more. Jess: Just fantastic. Adds variety with as little or as much complexity as you want, and makes each game feel a little different. Andrew: Agreed. This one is a no-brainer to add to basically all future games of Norsaga. As add-ons go, you may as well weld this one right onto the hull. So, as to our first question – does the Norsaga: Odds and Endings expansion pack renew our interest in the core game? Andrew: And that’s actually just fine! While Norsaga: Odds and Endings doesn’t reinvent Norsaga, I don’t feel it was ever meant to, nor should it have to. Jess: Exactly. Instead, what Norsaga: Odds and Endings gives us is a few new ways to add a bit of depth and replayability to the game. For fans of the original, Norsaga: Odds and Endings is simply a must-have, because it gives you more of what makes Norsaga unique. What it doesn’t do, of course, is change things up enough that it will keep less aggro gamers like ourselves interested in the core gameplay. Ultimately, Norsaga still simply isn’t our kinda game, and that’s just fine. But with that caveat, we absolutely recommend heading over to the Norsaga: Odds and Endings Kickstarter.